iHeartPrettyPolish: Rainbow Favorites Challenge - Purple! Rainbow Favorites Challenge - Purple! Yipppee! It's "Purple Day" in the Rainbow Challenge. Purple has been my favorite color since day 1. I always had a purple room growing up, purple clothes, purple jewelry...my husband just gave me an Amethyst necklace for Mother's Day. It's also my birthstone - perfect! Like yesterday's blue (Butter London Lady Muck), this isn't a bright and exciting shade. I have realized that although I love all the bright and flashy colors; when it comes down to it, my favorites are pastels. I think they look better on me and I am just drawn to them. 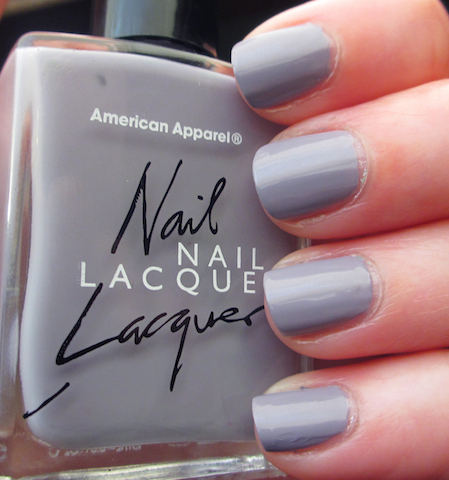 This was my first American Apparel polish. It's called "Factory Grey". 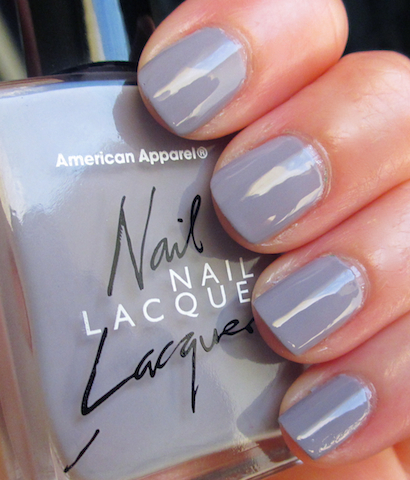 I have 2 American Apparel polishes and both of them are so creamy and opaque. They apply perfectly. I really do want to pick up more, I just have to wait until I get to Mall of America again. Check out the rest of the crews' purples! Have a happy Friday! Way to be true to yourself. :) This is a lovely, soft shade. I love how it's purple but neutral at the same time!